Although the colors of the Blue Ridge mountains have been proof of fall’s arrival for a few weeks, I really didn’t believe it until this past weekend: it finally got cold enough to turn on the heat. I love the smell of the heat going on for the first time; it definitely heralds a change of season, since our falls are susceptible to frequent boats of Indian summers. There are certain and pleasant aromas I will always associate with fall, like the heat going on for the first time, leaves burning, pies baking, and pot roast, um, roasting. Hubs and I decided to pop in a movie, warm up, and feast on autumn’s premiere main dish. Then we decided not to be selfish, and promptly invited my mama over to sup with us. Now, while I do enjoy my mama’s pot roast, mine is one of the few things I make that I prefer to hers. Why, you ask? Answer is simple: caramelized onions and beer! Two ingredients that are supposed to go with meat, in my point of view. And it ain’t just for Sunday dinners anymore, kiddos: this is prime man food, it is, and I dare you to find a man who disagrees…….well, ok. There might be some vegetarian/vegan/allergic-to-beef men out there. If you encounter one of those, well, grab some other man and he is sure to confess that yes, this pot roast recipe is the roast to end all other roasts. NOTE: If you don’t have a Dutch oven, a roasting pan will do fine. Be sure to still brown the meat first and then transfer all that is delicious and good into said roasting pan. If you can’t find a cover for your roasting pan, a large tent of aluminum foil will suffice. If you don’t have a Dutch oven and are in the market for one, may I suggest the following: Martha Stewart’s 5.5. quart Dutch oven, available at Macy’s. It’s a great size, easy to clean, and (if you click on the link) happens to be on sale at the current moment. 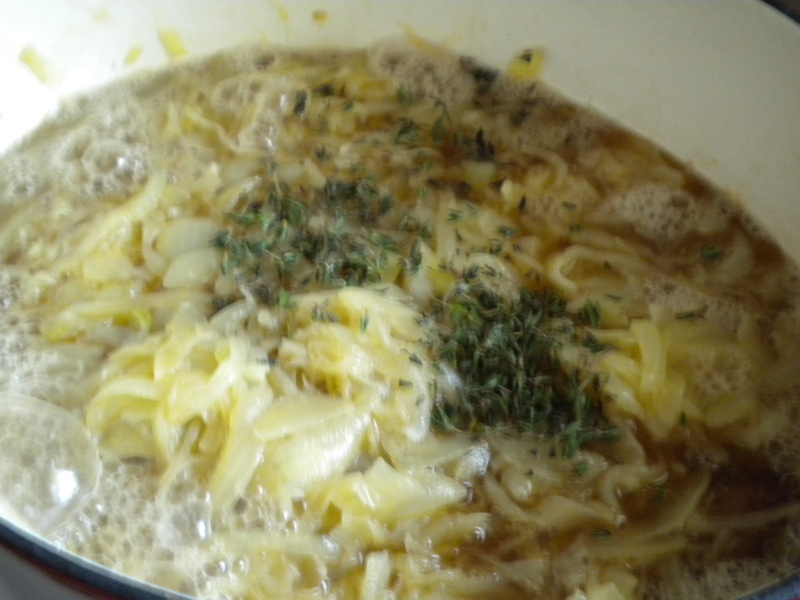 NOTE: …while your meat should turn out sweet and tender, the deliciousness is really in this gravy. 1–Melt 2 T. butter in decent-sized saucepan over medium heat. 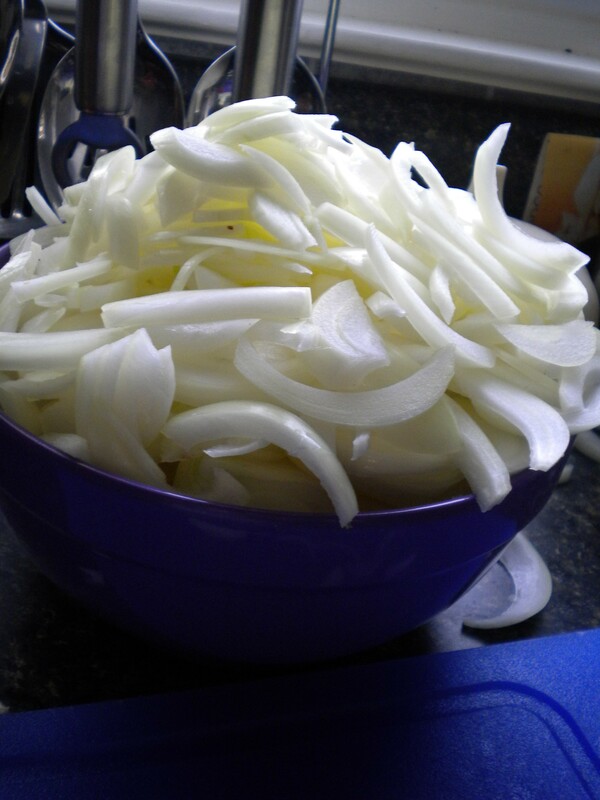 Add in 12 cups of onions (I use yellow, but white will work—this is about 1.5 lbs onions) and 1 1/2 tsp. sugar. You will need to stir this quite frequently, so that they turn a lovely golden shade of caramel. yeah, it's a ton of onions, but it makes the flavah!!! 2–Preheat your oven to 300 while you are tending to the onions. 3–Take a 3.5–4 lb. pot roast and season the sucker with salt, pepper, and garlic powder. (You can use whatever type of meat you usually use for pot roast, really, but we used bottom round, since that’s what was on sale.) Pop that baby in your Dutch oven (already Pammed/oiled/buttered/fatted up) and be sure to brown on all sides…..this should take up to five minutes. 4–Now comes the greatness! Pour all of the onions on top of the meat, along with 1 bottle of Newcastle beer, 1 1/2 cups beef broth, and a generous sprinkling of salt, pepper, garlic powder and whatever your taste buds dream up. 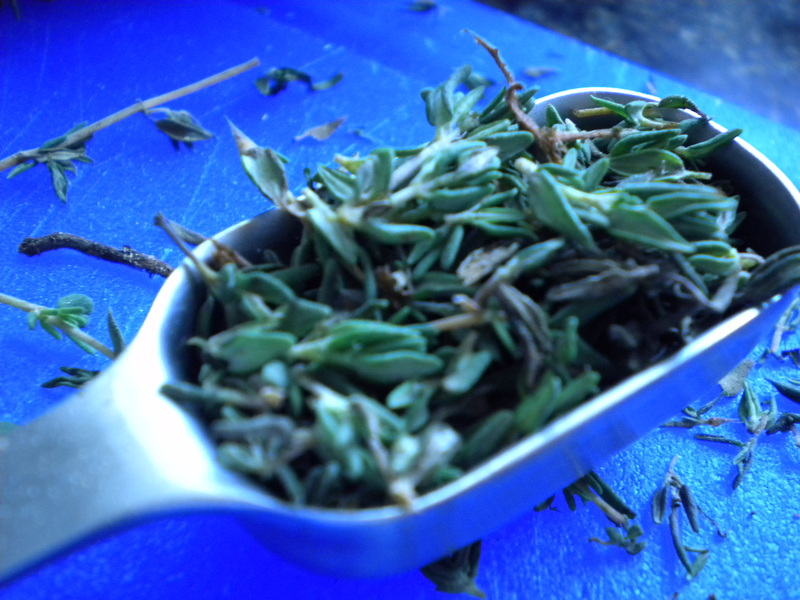 I have used a bay leaf before, but as my father-in-law will tell you, I am not a fan—we tried 1 T. fresh thyme leaves this go round, and it offered a nice flavor to the gravy. 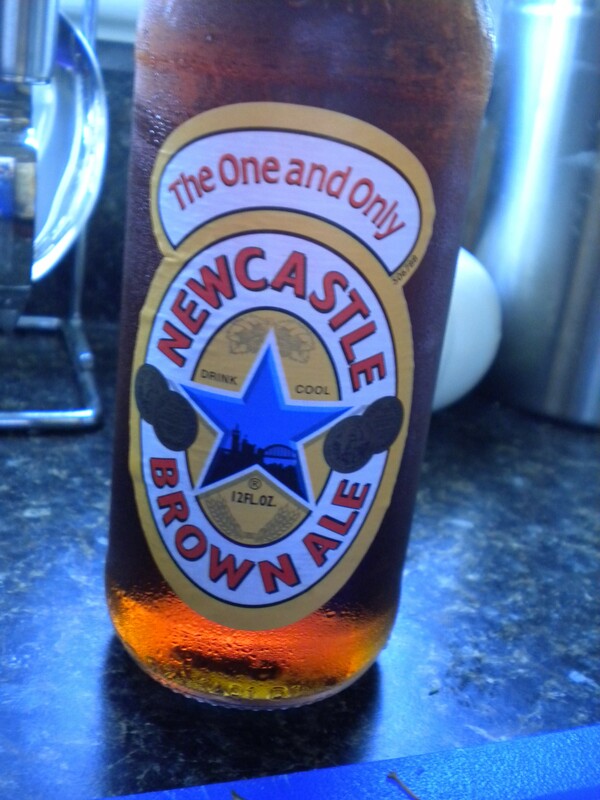 NOTE: you must use Newcastle as your beer, or at least one very similar to it. I haven’t dared try Guiness—too dark, I think—but you need a nut brown ale to recreate the flavor if you can’t get Newcastle. 5–Keep the roast covered tightly for 2 hours. You can turn it halfway through, which I usually do, as per my mother’s advice…….but I completely forgot to this time. And you know what? Didn’t make a bit of difference. When your roast is done, let it sit on the carving board to breathe a bit while you get the gravy going. 1–In a small bowl, combine about 2 T flour with 1/4 c. water and blend well. 2–Put the Dutch oven on a burner so that all the leftover goodness comes to a boil. Pour in your flour mixture and whisk well enough to give your triceps a fab workout or to get all the brown bits scraped up from the bottom of the pan……whatever happens first. Serve over egg noodles, or alongside a great heaping helping of mashed potatoes, sit down with the one you love, or at least like enough to get through an evening with, and enjoy!